Sometimes you stumble across a portfolio where the artist only has a couple of comic based pieces, other times there can be just one work so brilliant, you'd risk being stoned to death by fellow art lovers for putting something else beside it. These are Random Works of Wow, and illustrating the point this week is Eduardo Risso with Wolverine. Sure he had Vertigo's Spaceman recently, but the former Batman and 100 Bullets pulp whizz is just to good to be let to sleep, as this scared Lady of Liberty shows! What do you think? Sound off below, click to mega-enlarge or view more Random Works of Wow here. To see more of Risso's best in black and white, visit his personal website after the jump. Hope you are having a good weekend all! i wonder if this was inspired by the fight sequence on Liberty Island in the first X-Men movie. i've always thought the scrap between Wolverine and Sabertooth really could have been done better. 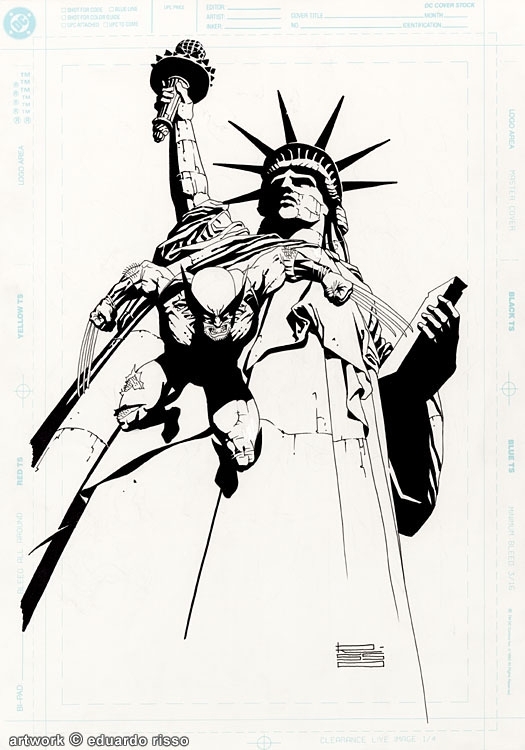 Awesome artwork as always by the talented Mr.Risso. I can't believe this guy doesn't have more steady work myself, since he's too talented to waste. What I think it missed Dave, was a talking Sabretooth. Victor is one of the most sinister speaking rouges alive. His manipulations and sneer make the character and neither big screen version as yet to me has captured that. He's like Hannibal Lector on steroids with a fur coat. At least to me anyways. The original X-Movie had the look and size down well, but not the personality. Schreiber had the attitude but physically just wasn't Creed enough for my liking. I'm just waiting for FOX's contract to run out so Marvel studios can bring the mutants into the cinematic fold. I don't think you're going to be alone there Craig! Then we can see all those great 50/50 characters like Scarlet Witch and Quicksilver who live in both franchises. I'd heard Marvel had already thought out introducing the Lehnsherr kids to the Avengers movie universe, but because of Fox and their stranglehold on all Marvel things mutant, were not going to be presented as being Magneto's children as the legally can't mention mutants while still under contract with FOX studios. Marvel unable to mention the word 'mutant'? That's the first sign of the Apocalypse isn't it Craig? Still, having the Scarlet Witch on screen would be pretty amazing - her powers could really let the SFX team go crazy!